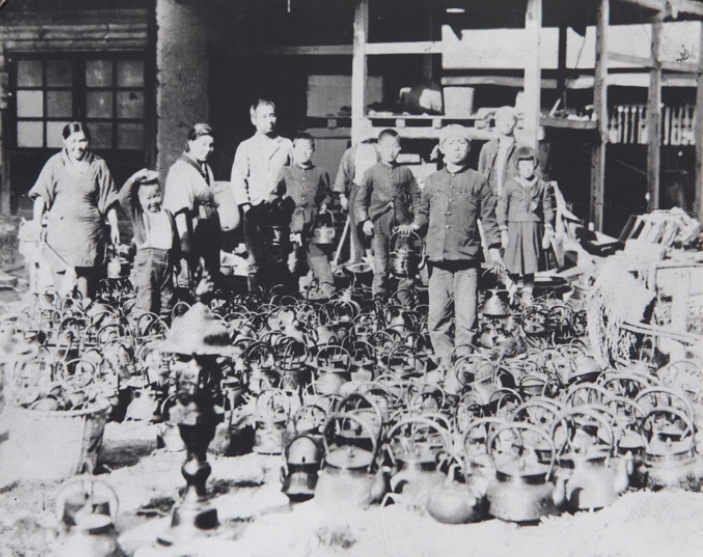 The mischievous little boy second from left holding a kettle lid on his head in the photo above taken 80 years ago is the current chairman of OIGEN Foundry, Genetsuro Oikawa. We asked him what life was like during that time. Life in Iwate 80 years ago. Based on Genetsuro’s description, they looked something like this. The flanged iron cooker on top measured around 30cm, so the iron stove itself was significantly larger. There was a hole in the side to feed firewood in. According to Genetsuro, they were made ‘out of necessity’. Kezurinakago? Having been born into an iron casting family, I’d heard of this before, but never seen it in action. Our ancestors didn’t have large cranes or steel frames, but still found ways to make things out of necessity. That is the true essence of making crafts that complement the lifestyle. “Soup was made in traditional pots with wooden lids, heated over an open hearth.” The house the chairman grew up in had a long earthen floor extending from the kitchen door. The iron stove was placed directly on the earthen floor, and the hearth was cut into a large raised wooden floor around 70cm high. 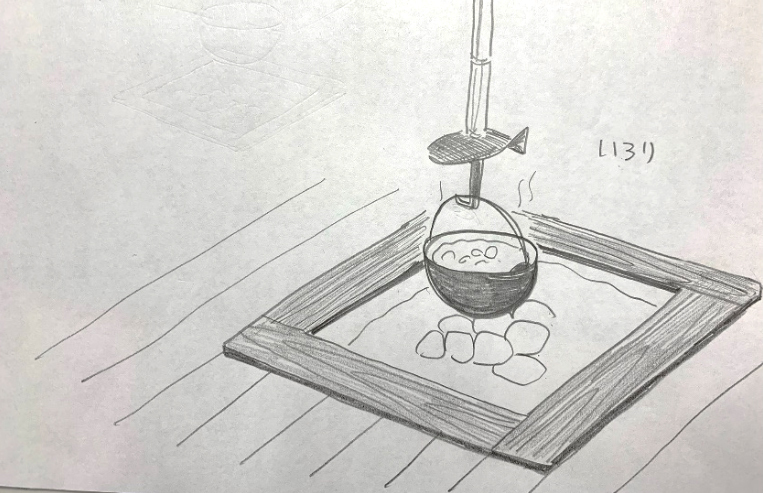 When not used for cooking, there was always a large pot called daishigama full of hot water hanging over the hearth. Hot water was a necessity in the cold Tohoku climate. 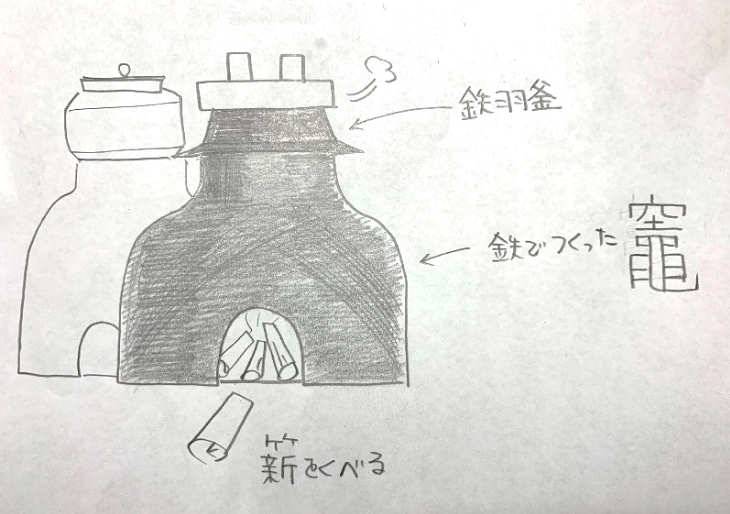 Daishigama: Otherwise known as Zogama (meaning ‘universal pot’) were used for practically anything, and are symbolic of the iron casting region. Iron pots were cleaned with a small bundle of straw, like a scrubbing brush we use nowadays. Pots were used every day, so there was always a little left over. By the time the chairman got married, the iron stoves had already been replaced by brick, and his wife has no recollection of iron stoves. She does, however, remember the straw scrubbing brushes. People made whatever tools were necessary, then sold them for other people to use too. It was a time where everything was out of necessity, where both craftspeople and the general population were living a day-by-day reality.